Birds of New York City - Discover Leslie Day's Field Guides To the Natural World of New York City. 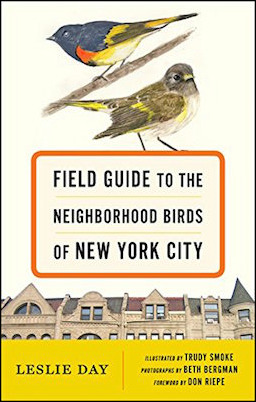 Click image to preview Field Guide to the Neighborhood Birds of New York City. will serve to connect readers to the rich birdlife and habitat of the city's five boroughs. - Susan Elbin, PhD, Director of Conservation and Science, New York City Audubon. Visually beautifuly, Leslie Day's Field Guide to the Neighborhood Birds of New York City manages to be clear and concise while including lesser-known salient features of each bird. the ruby-throat's call. - Rita McMahon, Director, Wild Bird Fund. Leslie day has compiled this long-awaited and superb book filled with stunning illustrations, photographs, and concise information. This welcome anthology of species that harmoniouslycoexist in our urban environment will be cherished by and is a must-have for anyone interested in the diverse avian community of New York City. - Anthony A. Pilny, DVM, The Center for Avian and Exotic Medicine. An excellent guide for New York City residents. If you have any interest in the birds around you (and there are plenty of birds around you, even in NYC), this guide will really open your eyes.